The UK MetOffice says there is a 10% chance that a strong El Nino combined with continuing AGW will produce a burp of global temps above the 1.5 degrees c. in one year between now and 2023. Until now, the hottest year on record was 2016, when the planet warmed 1.11C above pre-industrial levels, but the long-term trend is upward. Man-made greenhouse gases in the atmosphere are adding 0.2C of warming each decade but the incline of temperature charts is jagged due to natural variation: hotter El Niño years zig above the average, while cooler La Ninã years zag below. In the five-year forecast released on Wednesday, the Met Office highlights the first possibility of a natural El Niño combining with global warming to exceed the 1.5C mark. "Global Temperature in 2018 and Beyond"
The four warmest years in the GISS record are the past four years, 2015-2018. The strong 2015-16 El Niño in the equatorial Pacific Ocean is more prominent in the annual 2015 map than in 2016, yet the impact of the El Niño on global temperature is greater in 2016. This is a result of the lag of 3-4 months between El Niños and their effect on global temperature. Global land area has warmed about twice as much as global ocean, as shown in Figure 3. Linear fit to the period 1975-present yields a warming about 1.6°C over land and 08°C over ocean. If a substantial El Niño develops, 2019 global temperature is expected to rise, although it is unlikely that the El Niño will approach the strength of the 2015-16 El Niño. Continuing changes in global climate forcings also affect global temperature. The record 2016 global temperature was abetted by its near coincidence with a solar maximum (Figure 6). Climate forcing by greenhouse gases (GHGs) is the dominant drive for climate change, because it is continually increasing, but changing solar irradiance is not a negligible factor. It has been argued that the coming Solar Minimum could be prolonged with the irradiance declining below its range so far in the era of accurate satellite data, analogous to the Maunder Minimum of 1645-1715 (Eddy, 1976)4 when sunspots supposedly were almost absent. The next few years of solar irradiance data may be particularly informative. Y'all out of time already. And we are at weak El Nino conditions at the moment with lower solar irradiance. Running out of excuses for the deniers. The running 12-months has briefly dropped below the 30-year linear trend on GISS-LOTI. My guess is that it goes back above it in the next 2-3 months. February is on track for high anomaly. BTW the 30-year linear trend is 0.19°C/decade. Only a matter of time before it goes above 0.20°C/decade. This implies about -0.06 °C per decade combined cooling bias in HadCRUT4 over the last two decades. The trend in differences between CW-buoy and HadCRUT4 over 1997-2017 is -0.06 (±0.02) °C per decade. Note that coverage bias was more prominent up to about 2012, while the ship-buoy bias has come increasingly to the fore during the recent surge. Surprised at no mention. Massive jump in NCEP reanalysis dailies the last 2 weeks. February had the highest anomaly in nearly 2 years and March is off to a very warm start. February may come close to +1.0°C for GISS-LOTI based on Moyhu site. GISS came in at +0.92°C for February. 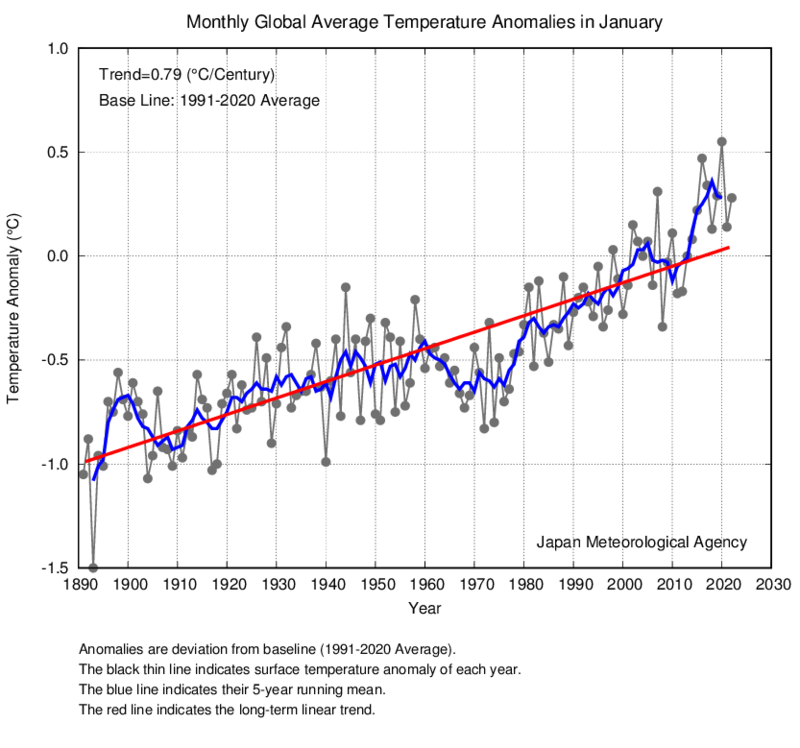 The running 12-month mean has just jogged below the 30-year linear trend of 0.19°C per decade. With this year’s ENSO cycle it should head back above it pretty soon. We may not be hitting that trend line again. Do you really believe that temperatures will not rise that much in the future? I shared Miki's interpretation, although when I read Klondike's question, I realized my interpretation was technically opposite what was written. I wait with bated breath Rboyd's elucidation. It's obvious rboyd meant we may not go as low as the trendline again. The 0.06 difference is significant when you consider that the HadCRUT4 trend is 0.14 / decade. That is what I meant, obviously. I agree and this means that for most of the period between 2015-2019 we will be above the trend. Say good bye to that GISS trendline. The last year or so of flat temps has had the denierati all excited about the coming "cooling". If only. The growth in N2O has been pretty constant over these three decades, while CFC 11 and 12 peaked in 2000 and are on a slow long term decline. HFC 134a and HCFC 22 have been slowly growing. The CO2E number is from the NOAA AGGI. The yearly CO2E (AGGI) increase averaged 4 for the past three years. With CO2 and CH4 probably having increased above trend in 2018, the CO2E (AGGI) increase could be 5ppm. Could we hit 6ppm this year with the ENSO-related jump in CO2? I think that the AGGI still uses 28 for the 100yr CO2 equivalency of CH4, so understates things versus the most up to date number (36?). If we take a 20-year view of CH4 (86-100 CO2 equivalent), then the actual increase in the earth energy imbalance is significantly greater. Makes sense why the temperature trend would be accelerating. With the changes to ship fuel oil regulations to greatly reduce sulphate emissions, together with China's attempts to reduce sulphate emissions (scrubbers etc. more than any real coal use reductions), the trend may be exacerbated by reductions in the dimming effects going forward. Although India is trying hard to keep up the rate of dimming with its increases in coal usage. I know it's not this simple, for a number of reasons, but I decided to do some very rough calculations as a thought experiment on the idea of a "carbon budget." Assumption: there's about a 15 year delay between emissions and when the increased radiative forcing from those emissions shows up in global temperature change. (I read this a few places, I'm not sure how accurate it is. I know that there are also much slower response times for ocean warming, and due to other feedbacks). 2017 GMSTA would include all of the warming caused from emissions up until the end of 2002. The total emissions of CO2 from fossil fuel use and land use change from 1959 to 2003 were 1008.69 Gt. According to NASA GISS data, GMSTA from 1974 to 2017 is roughly 1C. According to the 15 yr assumption, most of the warming in that period would be explained by the 1008.69 Gt of CO2 emissions. In the 15 years between 2003-2017, global CO2 emissions were 565.41 Gt, which is roughly 56% of the emissions from the previous 43 years. Shouldn't we expect that 15 years after 2017 (i.e 2032), we will see an additional 0.56C warming? That would bring us to approximately 1.75C warming since preindustrial (using NASA's figures). I seem to remember Ned W saying that emissions translate rather quickly into radiative forcing. Maybe one year. Radiative forcing contributes to warming as long as there is a radiative imbalance. I'm not sure how long this takes, but certainly we have more warming in the pipeline even if GHG levels stabilize (and they won't anytime soon). In the past few years the trends of both warming (increased methane and CO2 levels) and cooling (switching from coal to natural gas cuts sulfate aerosols, same with low-sulfate ship fuel and scrubbers) are accelerating in the wrong direction - so an accelerated increase in temperatures would be expected. Using the 20-year CO2 equivalent for methane delivers an overall CO2E for all GHG's of over 600ppm, net that out with the aerosol cooling effects and we may still be at a level of radiative forcing that is double that of pre-industrial times, and only just at the start of the accelerated trend in temperatures. - Continued focus on fracking with Trump removing the regulations on methane leaks. The energy expended in liquefaction makes this even worse. The end result may catch the global community very much by surprise in the next few years, maybe we get a crisis in 2021/2022 in time for the big UN FCCC meetings. Then we get an accelerated focus on geoengineering? No major surprise but still a GISS +1.11°C March would’ve been a huge month prior to 2015-2016 Niño. Now mostly crickets. NCEP reanalysis still has the dailies up high into April. Could see another +1.0° C month. Running 12-month GISS-LOTI temperature is quickly heading back towards 30-year trend line. Of course due to accelerating warming the 12-month running temperature never dropped below the 40, 50 or 60 year trend line. True. However, those trend lines are less steep. This fits the "accelerating climate sensitivity" concept, the hotter it gets the higher the climate sensitivity. Also fits with the concepts of feedbacks kicking in, one after the other, as temperature rises. That’s the point. A more apples to apples comparison would have been overlapping 30-year trend lines. The trend is a derivative, the steepening of the trend lines is the 2nd derivative: acceleration. Here's your overlapping 30-year trends of the last 50 years. Overlap is every 10 years. Rounding up the trends are: 0.16°C per decade, 0.17°C per decade & the most recent 30 years is 0.20°C per decade.